In a landmark ruling the Information Commissioner has said that the York Council acted improperly earlier in the year when it turned down a Freedom of Information request for a list of Business Rate debtors in the City. The Council had said that it could not do so during the “purdah” period which precedes a Council election. It claimed that release of the information could “affect public support for a particular party”. In February 2018 – when the original request was lodged – a by election was taking place in the Holgate ward (although this would have been over before any information was likely to be published). The withheld information in this case related to the value of individual unpaid business rate accounts and the associated recovery action planned or undertaken including any amounts of money that had been written off. The Commissioner has now ordered the York Council to release the information within 35 days. Quite why this information was likely to influence a by election taking place in the Holgate Ward may remain a mystery. (Three of the four candidates there – at least – worked in the public sector and are highly unlikely to have had outstanding business rate debts). 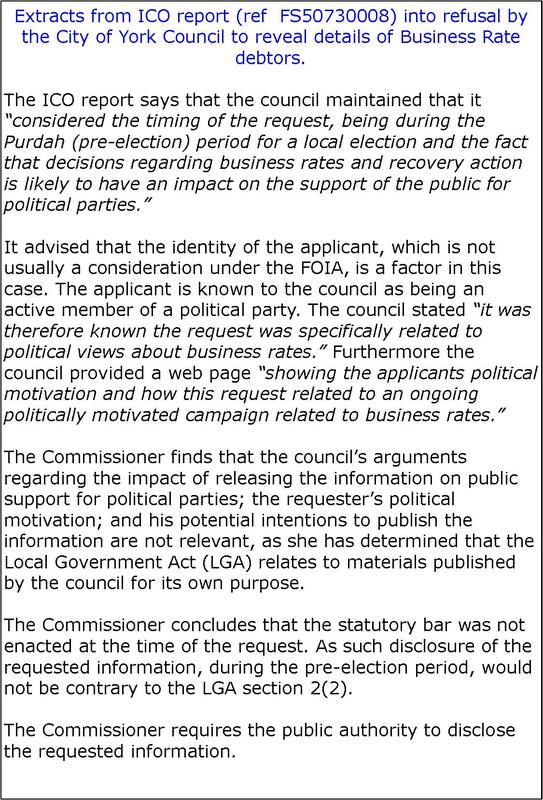 This is, however, the second time that the Council has refused to divulge information quoting the Purdah restrictions. In 2017 they declined to say how many enquiries each individual Councillor on the authority had recorded during the previous year. The information was eventually supplied after the election campaigns of that year had concluded. The Commissioners ruling therefore sets a precedent for how information requests must be treated by local Councils in the future. FOI requests can only reveal facts. It will be for residents to judge whether those facts influence their actions. If this includes their voting intentions, then so be it.